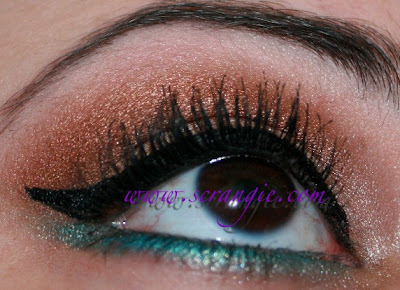 The last picture is supposed to show the pretty aqua sparkles on my lower lashline. I started off with Venus in the crease, but then I thought it looked ugly cause it wasn't dark enough and that's why I put Leather over it. I like Leather in the crease much better. The little hints of Venus at the upper edges look really pretty, though. Payoff was great on the shimmer shades, but I thought Leather could have used a little more pigment. They blend like butter. Next time I'm going to have to use more of the blue shades, I'm a little bored with the bronze eye look right now. Ughhh your eyeliner is always perfect! I want a tutorial on how you do your black liner with the extreme winged cat eye. I never get mine as perfect as yours. I do wing mine but think maybe it's my sticking to jell liner with a brush that gives me the best control I ever have found over pencils. But still cannot get it as great looking as yours! This looks so good!! I love the blue underneath. So pretty! 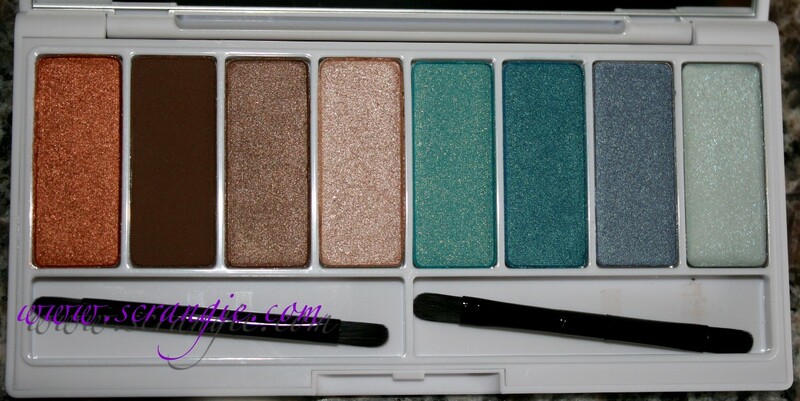 I think I might have to go out and buy this palette. Oh wow - that's really fantastic! I didn't think I wanted this palette, but your look has me changing my mind! Really pretty! Beautiful look! I love the aqua! This is soooo beautiful! I love it! Beautiful eye! Your liner is perfection. This is gorgeous! 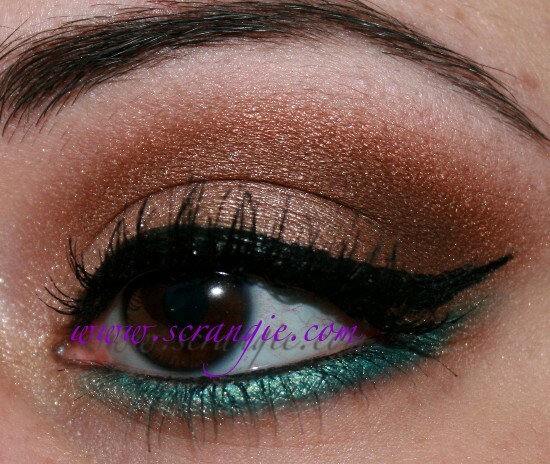 I really love how you did this look and the accent on the lower lash line is fantastic. So amazing! Your liner looks flawless! This is off topic but I figured you might respond to this post since it is recent. I was wondering, as several others have as well, why you do not recommend Del Sol polishes. Could you please say why not for the benefit of your blog followers? So far the other's comments/questions about it have not been answered. holy crap. i'm usually a lurker on blogs, but i could not keep silent on this post - THAT LINER IS PHENOMENAL. siiiiiigh, my wallet. AH I need this! so lovely on you. Can't wait to try it. Also, I was wondering what eyelash curler do you use? Your lashes are always so perfect looking! Random-string-of-letters-and-numbers, After I posted my first Del Sol review, I received lots of emails from readers telling me that the experienced terrible customer service online and at Del Sol stores. One of the main complaints was that the polishes were defective and Del Sol wouldn't honor their return policy or color guarantee. There's nothing wrong with the polishes but I didn't feel right recommending a store that so many people had a bad experience with. Though, it's been a few years since then and hopefully they've fixed their customer service issues! Beautiful makeup. I just got this in my Sephora order today.